Internet Archaeol. 25. Williams. The city walls. The city walls of Sultan Kala, with external bastions at regular intervals (Figs. 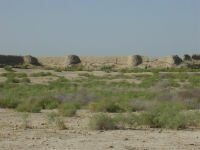 62 and 63), were constructed around AD 1080 by Malik Shah (Brun and Annaev 2001). The original western boundary of the city probably lay further to the east, so that when the religious complexes and elite houses were first established in this area they lay well outside the city limits. Figure 63: Archaeological recording in progress on a bastion of the Sultan Kala city wall: the cleaned portion shows the early wall face, after removal of part of the later additions that had substantially thickened the wall (traces of which can be seen to the left). The construction of the city wall in the 11th century is likely to have changed the ways in which this area linked to the urban space: for example, the putative gateway to the early city, to the south of the later main west gate (Fig. 34 - opens GIS), was not obviously replaced in the later city wall – so access to the Kyz Kalas, for example, would have been only from the main west gate and then south, rather than the more direct earlier access route (Fig. 64 - opens GIS).